Bike Maintenance: Is Your Machine Roadworthy? 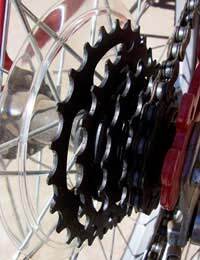 Home > Wheeled Sports > Bike Maintenance: Is Your Machine Roadworthy? Even budding cyclists on a modest budget are unlikely to see much change from £250 when buying their first bike. Having made this substantial investment, it only makes sense to ensure that the machine is kept in excellent condition, not only to ensure the rider receives value for money but also in order that safety is not compromised because, for example, brake cables or tyres were not checked on a regular basis for roadworthiness. A good starting point for getting to know a new bike is the six-week check that many retailers offer as part of the purchase price. The time period for this check is arbitrary, depending to a great degree on how many miles a new machine has clocked up. In essence the mechanic will examine how the bike has responded to life on the road. Brake cables will stretch so they may need adjustment, and a quick check of the nuts and bolts, including judicious tightening where needed, will be among the boxes being ticked. Take the time to talk to the mechanic, and ask as many questions as possible. It may, for example, be a good idea to ask for a rundown on how to change a tyre and which areas will need a shot of WD40 from time to time to ensure smooth interaction of the moving parts. Apart from the wheels, the most obvious moving part is the chain. This should be checked and cleaned regularly, either with a cloth and a can of compressed air to loosen more stubborn pieces of mud and grit, or with one of the specifically designed chain cleaners. Turn the bike upside down when carrying out this operation, and remember to turn the pedals manually when you have finished to ensure that the chain is moving freely. Pay attention to your saddle, too. Ensure that it is securely tightened on the post to prevent vertical or horizontal movement while you are riding. A twist or two with a ball spanner at regular intervals will give you peace of mind. How often you change your tyres is down to how regularly you ride. Once you see the tread fading, take the sensible option and invest in a new set. The tread should also be checked before every ride to ensure that there are no foreign bodies such as glass or nails embedded in the rubber. These can quickly work their way through to the inner tube and cause a flat. Give your tyres a pinch, too, before setting off - they may need a couple of bursts from the pump to keep them inflated to the correct psi (pounds per square inch). Underinflated tyres are one of the major causes of flats, particularly troublesome “snakebites” which involve a double tear in the material. A set of basic tools should have been included in your total purchase at the bike shop. If you neglected to do this, correct this at the first opportunity: a set of Allen keys, a ball spanner, spare inner tube and puncture kit are the obvious items that should be on your shopping list, along with a saddle pack to store them in. Again, when in doubt seek the advice of the bike shop proprietor or mechanic. Most importantly, don’t be afraid of your bike. Get to know the fundamentals of how it works as this is the starting point for having the ability to diagnose and correct faults when they occur. You’ll both be spending many miles together on the road ahead, so it only makes sense to take care of each other. What is Turning Women Off Cycling?